August is not typically a busy time of the year for the GPU industry. But this is quickly turning out to be anything but a normal August. Between professional and consumer graphics cards we have a busy week ahead. Kicking things off on the consumer side today, AMD is announcing that they will be releasing a new Radeon HD 7950 with higher clockspeeds. The new 7950, to be called the Radeon HD 7950, is a revised version of the existing 7950 that is receiving the same performance enhancements that the 7970 received back in June, which were the basis of the Radeon HD 7970 GHz Edition. Diving right into things, the new 7950 – which we’re going to call the 7950B for lack of a distinct official name – is a performance enhanced part based on the same process that AMD used to create the Radeon HD 7970 GHz Edition. Like the 7970GE, AMD is doing two things here for the 7950B: they’re increasing the base clockspeed, and they’re also introducing their GPU turbo boost functionality to potentially push clockspeeds higher. With these enhancements the clockspeeds for the 7950B will be 850MHz for the base clock, 925MHz for the boost clock, and the memory clock is kept at 5GHz. As a result the GPU clockspeed difference is anywhere between 50MHz (6%) at its base and 125MHz (16%) at the highest boost clock. Because only the core clock is changing, the performance difference between the 7950 and 7950B will be heavily dependent on whether the game/application at hand is GPU limited; heavily GPU limited tasks (that can stay within the power limits) will benefit the most, while memory bandwidth limited or CPU limited tasks may not benefit at all. So how is AMD pulling this off? We’ve already covered AMD’s PowerTune Technology With Boost (PT Boost) in depth with the 7970GE review, but in case you missed it, here’s a quick refresher. At its most basic level, PT is a combination of BIOS and Catalyst driver changes that allow AMD to overdrive the GPU when conditions permit. In practice PT Boost is very similar to NVIDIA’s GPU Boost. Both technologies are based around the concept of a base clock (or engine clock in AMD’s terminology) with a set voltage, and then one or more boost bins with an associated voltage that the GPU can move to as power/thermal conditions permit. In essence PT Boost allows suitably equipped cards to overvolt and overclock themselves to a limited degree. Under the hood, the current incarnation of PT Boost is primarily designed to take advantage of AMD’s previously conservative specifications for the Radeon HD 7950. In implementing their PowerTune technology, AMD opted to base their power consumption calculations around the worst case scenario for leakage, thereby ensuring no card ever exceeded its designated PowerTune limit at an opportunity cost of having not maximized performance. PT Boost effectively inverses this methodology, implementing a Digital Temperate Estimation (DTE) algorithm to determine the real leakage at any given time. By accurately estimating a GPU’s leakage AMD can push the GPU closer to its limits, thereby maximizing its performance. The tradeoff of course is that real power consumption will increase, as AMD’s cards are now eating into what was previously a large power buffer. 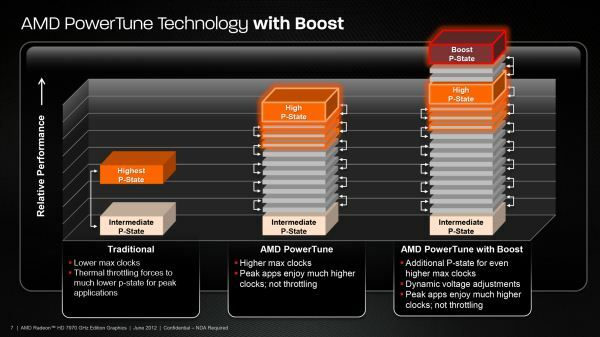 Moving on, since PT Boost was designed against AMD’s existing hardware, AMD and their partners have been taking advantage of this design choice by deploying it on existing 7900 series hardware. Just as how the 7970GE was built on existing 7970 board designs, the 7950B specs are intended to be deployed as an upgrade for existing 7950 designs. As with the 7970GE, the real change here is that AMD is qualifying their GPUs to operate at higher voltage/clockspeed combinations. For our converted reference card the new base voltage is 1.125v for 850MHz, up from 1.093v for 800MHz on the original 7950. Meanwhile the boost voltage goes much higher, with AMD using a rather high 1.25v for the 925MHz boost clock. In fact this ends up being the highest voltage a reference Tahiti card operates at, as even the reference 7970GE only used 1.218v. These numbers paint an interesting picture, albeit not one that is particularly rosy. For the 7970 AMD was already working with top bin Tahiti GPUs, so to make a 7970GE they just needed to apply a bit more voltage and call it a day. The 7950 on the other hand is largely composed of salvaged GPUs that failed to meet 7970 specifications. GPUs that failed due to damaged units aren’t such a big problem here, but GPUs that failed to meet clockspeed targets are another matter. As a result of the fact that AMD is working with salvaged GPUs, AMD has to apply a lot more voltage to a 7950 to guarantee that those poorly clocking GPUs will correctly hit the 925MHz boost clock. With that in mind however, all of this appears to be a calculated risk on AMD’s part. The reality of AMD’s situation is that Tahiti can’t compete with GK104’s power efficiency. Tahiti is a clearly superior GPU for compute purposes, but when it comes to gaming AMD and NVIDIA’s best products are virtually tied in performance, a matchup that leaves NVIDIA holding the smaller, lower power GPU. So what is AMD to do in such a situation? If the 7970GE didn’t make it obvious, the 7950B does: forgo all pretense of power efficiency and focus on performance-per-dollar. With both the 7970GE and 7950B AMD has notably increased their power consumption. We’ll take a look at the numbers in-depth in a bit, but the important change is that based on our data the 7950B is now drawing more power than the GTX 680. This isn’t necessarily a bad tradeoff – after all everyone likes more performance – but like all tradeoffs it does come with consequences. For the 7950B in particular, this means that the TDP has gone up from 200W for the 7950 to 225W for the 7950B.